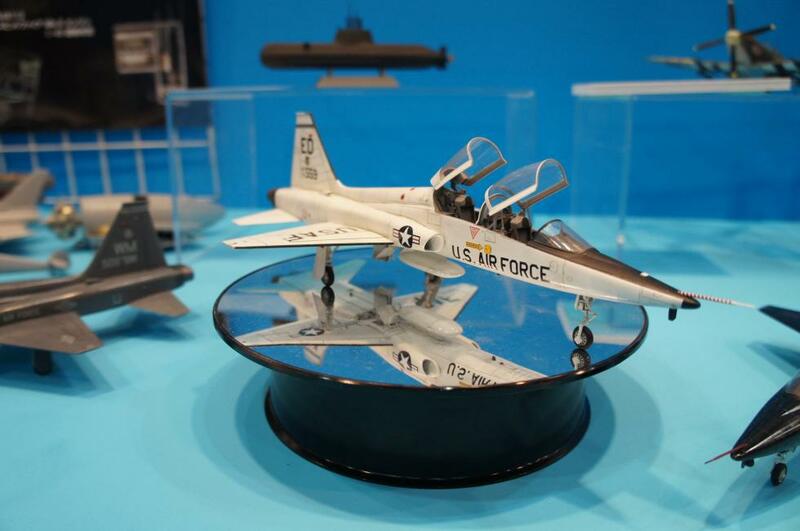 Another fierce commercial combat in view as Trumpeter has also announced a T-38 Talon kit for 2013 - ref.02852. I have been waiting for a good T-38 Talon! Here at Robins, we get the pilots from Columbus M.S. (pilot training) coming in weekly. The paint job is a very cool gloss light/dark grey camo. Great to finally see some pictures of plastic! I've been waiting for this one for about 2 years, ever since some strange preorder appeared on Hobbysearch/1999. A few weeks ago in Telford they had some official ads for it, but no sprue or mould pictures yet. Edwards markings are right up my street as well. I really really hope it will at least have the external shapes and landing gear right, for a PROPER T-38, not some F-5B offspring. If the cockpit and wheel wells are a bit under-detailled I could always try and make use of the Sword resin and PE. I think the Trumpeter T-38 has recently disappeared from their release lists though...or has it re-appeared? Anymore news on this release? They need to do one in U.S. Naval Test Pilot School markings. It is in the 2013-14 catalogue released at the beginning of the year. Yes, seen that now in the "Trumpeter releases 2013/14" thread. I think Wolfpack has their kits moulded at Kinetic. Let's see which one will have the edge. Wolfpack has just released some nice early F-5/T-33 seats in resin which will hopefully be included in the kit. Yes, I'm feelin' it! Looks like I need to purchase W'pack's early F-5B seats as well as the seats in the kit are the later type with the large headrest box which wouldn't be correct for a 60s era T-38. My Sword kit on the shelf looks rather sad now - perhaps the resin cockpit might fit into the Wolfpack kit though. Any chance to see this kit in a Hannants store?????? Got one ordered. I'm all sweaty! I have the Sword kit, what makes this new kit better? Sorry - couldn't help it. I have this kit my self and first impression is top class quality! Interests:I like most modelling subjects !